As I turned the corner into Bevans Way at 6am yesterday morning I could hear the chants of hundreds of voices “Unite the workers – Zindabad”. Over 200 pickets were massed outside 2 Sisters and the mood was confident and strong. About 250 people work there and everyone was out on the picket line. One of the strikers addressed the picket telling us about negotiations with the owner of the 2 Sisters group. A group which provides food for Harrods, Waitrose, Sainsbury and Tesco and employs 18,000 people over 35 sites with annual sales of £2.3billion. The boss pleaded poverty and said that gas and electricity were going up and bills were all increasing. He couldn’t afford to pay more. What about our bills; what about our children’s food shouted the pickets. The strikers that I spoke to all felt confident that they would win. But lorries were not all being turned back and people were not confident enough to stand in the road and actually block it. There were no police and with over 200 pickets they could easily have done this. There are strikes on 18th and 21st December. If you want to cheer yourself up for Christmas get along and support the 2 Sisters workers. 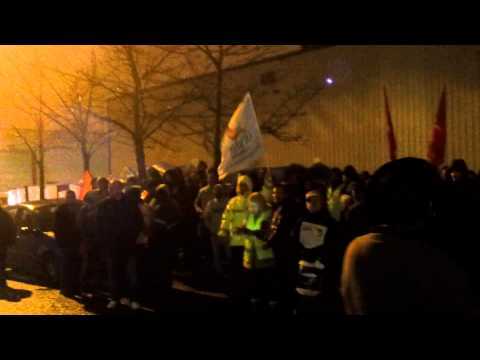 There were pickets at all 3 West Midlands sites of 2 Sisters with massive turnouts on all the picket lines.